The second 2015 PBA Commissioner’s Cup semifinals series started tonight with Denzel Bowles doing the heavy lifting for Purefoods, which beat Talk N Text to win Game 1. 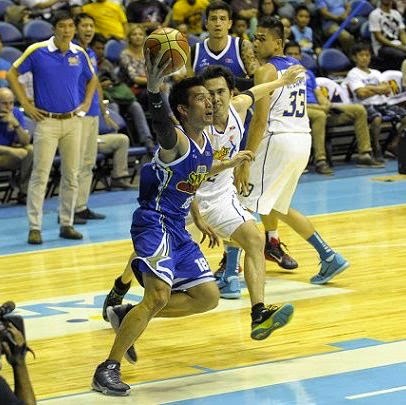 James Yap dropped 18 big ones as Purefoods drew first blood in their series. Purefoods Star import Denzel Bowles had another career game against Talk ‘N Text as he helped his Hotshots draw first blood, 100-94, in their best-of-five PBA Commissioner’s Cup semifinal series on Wednesday at the SMART-Araneta Coliseum. Bowles scored a career-high 49 points alongside 10 rebounds, 5 assists, and 2 blocks for Purefoods, which is now two wins away from booking a return to the PBA Finals. The import eclipsed his previous career-high of 39, which he also set against Talk ‘N Text. 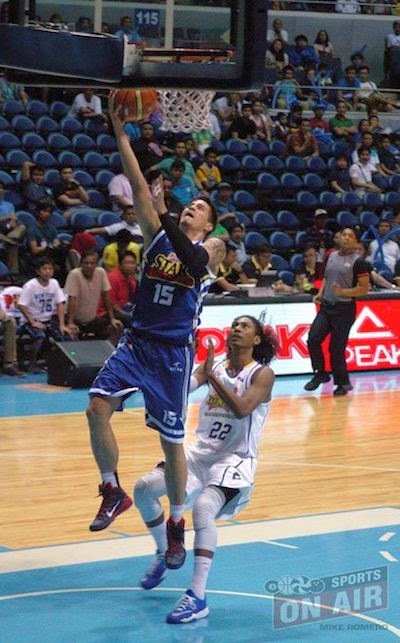 James Yap added 18 points, including two three-pointers, while Joe Devance hauled down 11 rebounds. Bowles brought out the big guns for the semis, scoring 18 points on a near-pristine 9-for-10 shooting in the first quarter. He topped Talk ‘N Text’s entire team output in the first as Purefoods took a 33-17 lead. The dominant Hotshots import had 29 points on 14-for-18 shooting by the halftime break, outplaying Tropang Texters counterpart Ivan Johnson, who had an uncharacteristically low five points on 2-for-7 shooting. Johnson, though, came out like a different player in the third quarter. With a renewed attitude, he repeatedly got inside for easy buckets as he tallied 16 points in the period, leading the Talk ‘N Text comeback. After putting up only 36 in the first half, Talk ‘N Text put 34 points on the board in the third quarter. But despite their efforts, a late burst from the Hotshots, led by PJ Simon, still made it an 11-point game, 81-70, heading into the final period. Talk ‘N Text went back on the attack in the fourth, outgunning Purefoods, 13-3, to open the quarter. They scored nine unanswered points on a Johnson three-pointer, a Kevin Alas and-one and a booming Ranidel De Ocampo triple that got them to within one, 84-83. But Bowles, who scored eight of Purefoods’ first 12 points of the fourth, kept his team afloat with some big baskets that helped keep Talk ‘N Text at bay. Mark Barroca came up with one of the biggest shots of the game as Bowles airballed a three-point attempt at the end of the shotclock and Barroca completed an acrobatic no-look putback to beat the buzzer and make it an eight-point game, 97-89, inside the final minute. Things got heated in the dying seconds as Alas and Mallari both drew technicals for engaging in some shoving near the end. Johnson finished with 33 points to pace TNT, while Jayson Castro and RDO added 19 and 15 respectively. 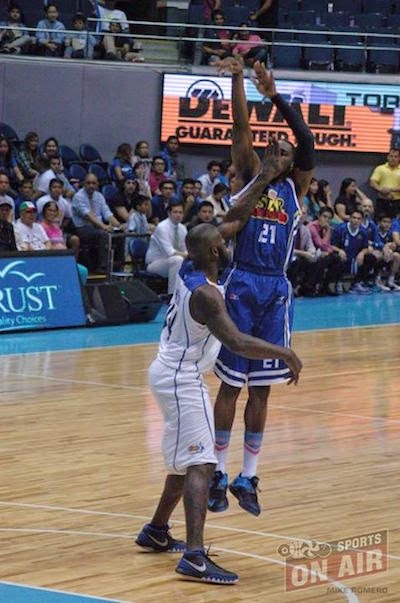 Line of the Game: Denzel Bowles (PUR) - 49pts, 10rebs, 5asts, 2blks, 23/36 FGs. Denzel Bowles was unstoppable in Game 1. Marc Pingris goes up for an easy lay-up. He did go down with an injury, though.